The U.S. is looking into possible Russian involvement in an attack that prompted a U.S. counterstrike Wednesday. The U.S. is looking at whether Russian contractors might have been involved in a Wednesday attack on U.S. fighters and their partners, according to CNN. That could complicate not only the U.S.-Russia relationship but also American involvement in Syria. Officials with U.S. Operation Inherent Resolve said they hit pro-regime forces in response to what they called an unprovoked attack from President Bashar al-Assad's backers. That's the attack Russia might've had a hand in. Assad regime forces hit the headquarters of the Syrian Democratic Forces. U.S. troops were there at the time, but none of them were hurt. So the U.S. hit back. It's one of a few recent examples of U.S. fighters engaging directly against Assad's soldiers. Inherent Resolve is in Syria and Iraq with an explicit objective to defeat ISIS, not to fight Assad's forces. But that's been a challenging line for the U.S. to walk as human rights violations stack up against Assad and as his regime's forces threaten U.S. troops and their allies. In June last year, a U.S. Navy jet shot down a Syrian plane after it attacked U.S.-backed fighters on the ground. And coalition planes have hit regime forces posing a threat to a base in Syria that hosts U.S. and coalition advisers. To be clear, it's not certain Russia was involved in the attack that prompted Wednesday's strike. 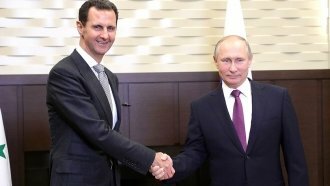 But if it was, it could confound an already clamorous dynamic between the U.S. and Russia — especially when it comes to Syria. Just this week, the two countries clashed at the U.N. over Syria's use of chemical weapons. Officials haven't ruled out Iranian involvement in the initial attack.